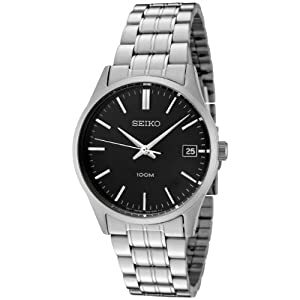 With a minimalist design, this watch features a black dial with silver toned hands. It has a stainless steel bezel and band. It uses a Japanese quartz movement for spot-on time-keeping. And it's water resistant to 100 meters (330 feet). The date is shown at the 3 position. There are no numbers on the dial, just markers. None of the markers or hands is luminous, so you can't tell time in the dark (in case that's important). The watch is dressy enough to be worn with a suit or chinos. It's very light - so lightweight that he might forget he's wearing it.